More than 90% NRIs rejected the two functions. NRIpress-Club members decided, "Not to involve in these kind of projects where dividing the NRI community"
Is Personalized power being used for personal gain. Two Diwali functions should not be exercised at same Artesia Ground on Nov 01 and Nov 07, according to NRIpress-Club's survey by calling more than 25 NRIs including politicians, business owners, associations and Philanthropists who support the functions all the time. "One function cost minimum $20,000. This is wastage of public money minimum $20,000 if they do two functions," said Ravi Sharma from Riverside. "I feel that these people have ego problem and not spending one penny from their pocket." "We don’t want to get anyone in trouble, but we did want to make Artesia officials to aware of a particular situation in Chamber of Commerce where some NRI official using power for personal gain to celebrate religious function under the umbrella of Chamber of Commerce," said one association organizer. "Your Children and local American politician laugh on you, when you and your associates are doing action like this," a student of UCI told NRIpress. "We respect our NRI first generation elders but we and general public does not accept their actions." "Enough is enough and you will be out very soon because social media will kill you," Amiksha Patel, who owns few hotels, told NRIpress." You are wasting people's hard money, please do one function." "Believe it or not, we business people are working 15 hours a day to pay our bills," a restaurant owner on pioneer street said. "we cannot afford our booth on two functions because public is divided. If we go on one place other one become mad. PLEASE DON'T DIVIDE US"
"With two functions, they are dividing our community, businesses and our families," said Naresh Sharma. "they never understand that who has a time to go both functions." "NRIs are losing their reputation in India because of these kinds of poor activities," NRIpress reporter from new Delhi said. "No body understands that why these people are doing two functions when they can serve the purpose with one function. "I told One group leader, who is organizing the function, please remove my name as a sponsor because I never promise you," a southern California politician told us. "Interestingly the group leader said, sir don't worry about money, we like to use your name." To help the NRI (Non-resident Indian) community, NRIpress-Club was established under the umbrella of NRIpress.com, Inc.
As a strong team of more than 60 entrepreneurs, we always like to see one function of Aug 15, Jan 26 and Diwali in Artesia. After talking businessmen, Entrepreneurs and Philanthropists, Gary Singh announced to celebrate Diwali as big functions by getting help of more than 60 NRI associations and business Community. Dr. Manorama was agreed and booked the Jain Mandir for Nov 07, 2015. We also agreed to control the stage by hiring MC, recognize all Philanthropists, associations and people who actually helping our NRI community. We must also develop such an environment that people should think that we are not controlling the stage. I talked to city of Norwalk yesterday. This week is spring break so we can not get a answer. We have to wait until next week. "Parimal Shah has booked the Artesia Ground for Nov 01 to celebrate Diwali," Anil Mahajan told Gary Singh on telephone. " but I am not involved in this project and I have no interest in this event." Some NRIs are simply power hungry and prone to use their power to subjugate others. Socialized power/Personalized power: The question we're often asked is "why and how does power corrupt leaders?" Socialized power is power used to benefit others. We hope that our elected officials have this sort of power in mind and are primarily concerned with the best interests of their constituents. Personalized power is using power for personal gain. It dominates and the leader gains, often at the followers' expense. When Leaders become "intoxicated" by power - engaging in wrong behavior simply because they can get away with it and use personalized power for personal gain…The NRI Community does not accept its authority to make such a declaration. Almost two weeks back, on Aug 15, 2015, two associations UFICA and FIA celebrated India's 69th Independence Day….. What did they get from this by paying $20,000 to actress Raveena Tandon for 2-3 hours,. Nothing but disrespect NRI in whole India by top lines like this: "Drunk man misbehaves with Raveena Tandon at I-Day event in US." NRIpress-Club’s Position: When NRIpress-Club’s organizers found that two Dewali mela events are announced to celebrate in first week of Nov, 2015, NRIpress-Club members decided, "Not to involve in these kind of projects where dividing the NRI community." We requested Dr. Manorama Sharma to call Primal Shah to work together. Primal Shah told her that he would discuss with Anil Mahajan to have meeting...... but never happened. 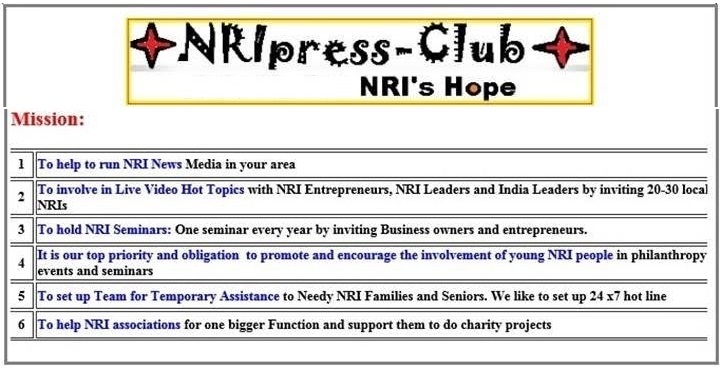 NRIpress-Club already decided that they will not participate because of their mission.